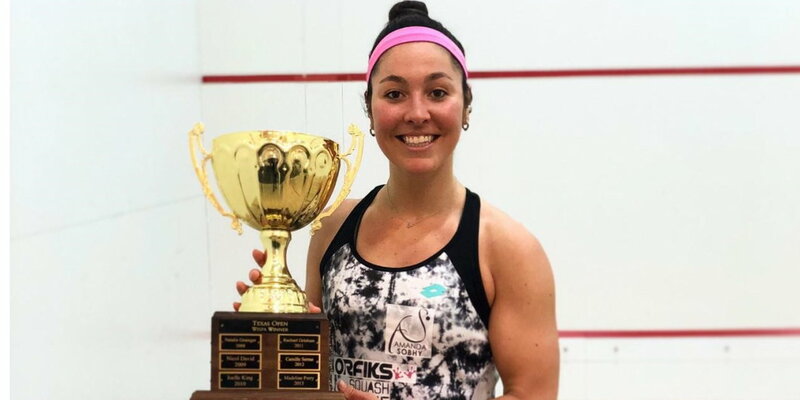 United States No.1 Amanda Sobhy claimed her 15th and biggest PSA title after she defeated England's Victoria Lust in straight-games to lift the J Warren Young Memorial Texas Open title. World No.13 Sobhy made it a hat-trick of victories at the Texas Open following wins last season and in 2015 after she downed Lust to take home the PSA World Tour Bronze tournament. Number two seed Sobhy had been in strong form all week, not dropping a single game throughout the entire tournament and defeating the likes of compatriot Olivia Fiechter and Egypt's Nadine Shahin en route to the final. 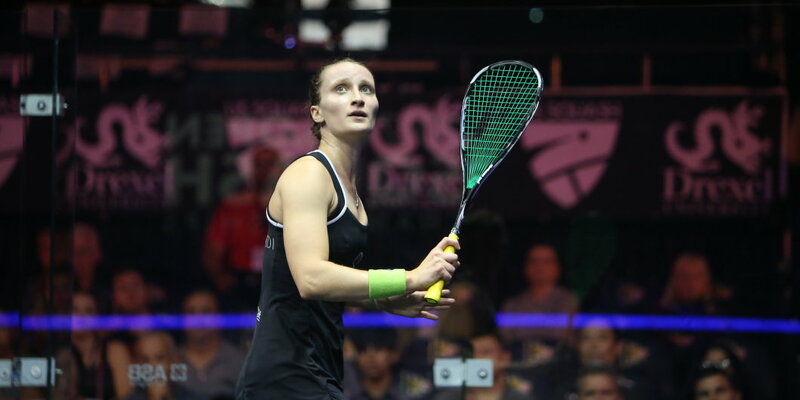 World No.14 Lust, on the other hand, had downed former World No.1 Rachael Grinham in the semi-finals to advance, however, Sobhy proved too much for her in the final as the American powered to an 11-4, 11-2, 11-5 in just 23 minutes to claim her seventh straight win over the Englishwoman. “Texas has a great place in my heart,” said 25-year-old Sobhy following her victory. “I remember coming back here as a 15 year old as one of my first tournaments on the tour and I still love it now, not just because I have won the title several times. The Dallas community is smaller than some but they still show great support. “I don't think the match could have gone any better. The past few times me and Lusty have played it was a battle and I barely won, but today and all week I have been feeling really relaxed and have been enjoying my game. “I just went out there and tried to enjoy myself as much as possible and I think it showed in my squash and my movement too was very free-flowing. “I'm really pleased to win it for a third time and defend my title that I won in Houston last year. This is my biggest title to date and I haven't won one since the Texas Open last year. US No.1 Amanda Sobhy and England’s World No.14 Victoria Lust will line up in the final of the J Warren Young Memorial Texas Open after coming through their respective semi-final fixtures with 3-0 wins at the T Boone Pickens YMCA in Dallas. Sobhy will compete in the final of the PSA World Tour Bronze tournament for a second year in a row as she kept her 100 per cent record going at this year’s tournament as she eased past fellow American Olivia Fiechter, winning 11-5, 11-8, 11-8 in 28 minutes. Fiechter has played at a level far above her current ranking of World No.52 this week as she claimed scalps against World No.10 Tesni Evans and World No.29 Hollie Naughton to book a place in her biggest ever semi-final on the PSA Tour. But her match against roommate and close friend Sobhy was a step too far for the New York-based 23-year-old as she went down in straight games. “Liv’s been playing really well all week, I think she’s a little bit tired and I know she was maybe feeling a bit because I’ve been rooming with her the past few days,” said Sobhy. “It was a good match regardless, and I’m really happy for her that she got into the semis of a $50k. I was able to win in three, which preserved my body, and I’ll go into the finals relatively fresh. Lust ended Australian legend Rachael Grinham’s run as she overcame the former World Champion by an 11-8, 11-2, 11-4 score line. 42-year-old Grinham, a former World No.1, stunned World No.6 Sarah-Jane Perry in five games 24 hours previously, but she came up against an immovable object in Lust in the semi-finals as the English player booked her place in the biggest PSA Tour final of her career. “The match went well, I think maybe Rachael is a little bit tired from yesterday, she had a hard match, but the first game was very tough,” Lust said. Australian veteran Rachael Grinham rolled back the years to claim a stunning victory over top seed Sarah-Jane Perry to reach the semi-finals of the J Warren Young Memorial Texas Open, PSA World Tour Bronze tournament in Dallas. 42-year-old Grinham – the 2007 World Champion – took a shock two-game lead against World No.6 Perry, but the chance of a major win looked to have escaped her as the tournament’s top seed came back to draw level at 2-2. A display of super shot-making from World No.31 Grinham saw her rack up points in the decider though as the claimed a narrow 11-9 victory to complete a shock victory. “It’s still kind of sinking in,” said Grinham afterwards. “Even winning in the first round of a $50k for me at the moment is great. I haven’t had that many good results because there are a lot of good players out there at the moment. Even though I haven’t felt like I’ve been playing badly, you’re still losing to a lot of lower-ranked players, and I think it hits your confidence a bit. She will play England’s Victoria Lust for a place in the final after No.4 seed Lust beat Belgium’s Tinne Gilis 11-2, 11-9, 11-9 in 49 minutes. After a comfortable victory in game one, Lust was made to work hard for the win in the final two games, but her speed and retrieval abilities helped her come through to win in straight games. “It feels really good, it was a solid, 3-0 win and you can’t do better than that really,” Lust said. The other semi-final fixture will be contested by two US hopes as World No.50 Olivia Fiechter continued her superb run to overcome Canada’s Hollie Naughton by a 3-1 margin. Fiechter scalped World No.10 Tesni Evans in the previous round, and the New York-based 23-year-old won again in front of vocal support as she booked a place in her first Bronze semi-final. “It feels amazing, last time I played Hollie was at the U.S. Open when I was 15 and we had a battle then too,” said Fiechter. Defending champion and US No.1 Amanda Sobhy will take on Fiechter in the semis. The World No.13 from Boston beat Egypt’s Nadine Shahin 3-0 in 22 minutes. Sobhy said: “I’m happy to win in three, I’m trying to preserve my body because I feel quite old these days. I know Nadine is a feisty, up-and-coming Egyptian, so it was crucial to come out strong in every game. “I’m very happy I did that because playing in a normal court is very bouncy, and it’s not really my style. I’m happy with my front court game and with the way I negated her attacks. You can follow the live scores from the tournament here. United States World No.52 Olivia Fiechter caused a huge upset to down World No.10 Tesni Evans in round two of the J Warren Young Memorial Texas Open PSA World Tour Bronze event, held in Dallas. 23-year-old Fiechter claimed a huge scalp over Welshwoman Evans as she played an intelligent game to oust the British National champion out of the draw at the first hurdle. The two players had never met before on the PSA World Tour and could not have had more contrasting records going into the encounter, with Evans playing in her 254th PSA match and Fiechter in her 33rd. The American took a 2-0 lead thanks to two wins on the tie-break, before Evans came back in the third to reduce the deficit. However, it was Fiechter who was able to hold on to close out a 12-10, 12-10, 8-11, 11-6 victory in 54 minutes. “It hasn’t really sunk in yet,” said Fiechter following her big win. Fiechter will now take on Canada’s Hollie Naughton for a place in the semi-finals. The World No.29 overcame Egypt’s World No.35 Nada Abbas to advance in Dallas and book her place in the last eight. Naughton took the opening game, before then being forced to come back from 2-1 down, including an 11-0 defeat in the third game, to win by an 11-7, 8-11, 0-11, 11-6, 13-11 scoreline in 51 minutes. “It was an interesting match the whole way through,” said 24-year-old Naughton. “It was quite up and down. I think sometimes you just have to win ugly and after that third game – it couldn’t really get worse from there – so, you need to get out there and get stuck in and play squash. Stop thinking about making everything perfect and just win ugly and fight and play my game. Elsewhere, United States No.1 Amanda Sobhy took just 23 minutes to defeat the Czech Republic’s Anna Serme by an 11-3, 11-5, 11-2 scoreline. She will now face Egypt’s Nadine Shahin for a place in the semi-finals after the Egyptian defeated United States’ Haley Mendez, 4-11, 11-8, 13-11, 11-2. Belgium’s World No.43 Tinne Gilis overcame number six seed Netherlands’ Milou van der Heijden to advance to the quarter-finals of the J Warren Young Memorial Texas Open in Dallas, United States. 21-year-old Gilis went 2-0 up and was then forced to hold off a comeback from the Dutch player as she pushed proceedings to a tight fifth, which Gilis was then able to close out by an 11-4, 11-9, 7-11, 11-13, 11-8 scoreline in 65 minutes. She will now face England’s World No.14 Victoria Lust for a place in the last four after the 29-year-old defeated Finland’s Emilia Soini 11-8, 11-7, 11-3 in 22 minutes. The other quarter-final match from the top-half of the draw will see England’s top seed Sarah-Jane Perry take on former World No.1 and former World Champion Rachael Grinham. 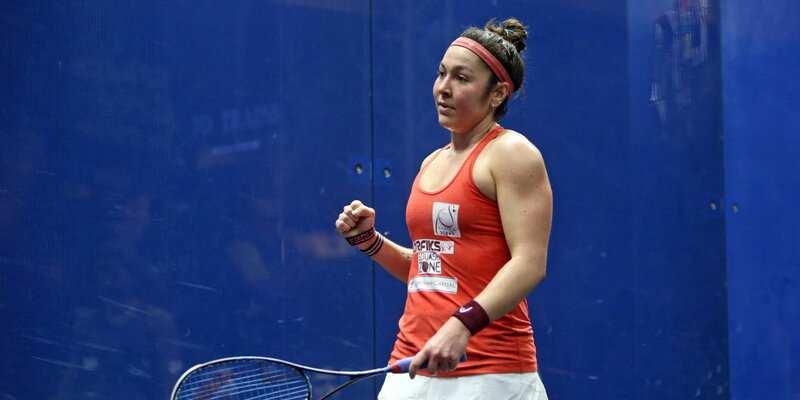 Perry took just 19 minutes to despatch Welshwoman Ali Loke by an 11-7, 11-5, 11-5 margin. Meanwhile, Grinham was pushed all the way to five-games to secure her place in the last eight after coming from a game down to defeat Egypt’s Menna Nasser, 6-11, 11-3, 14-12, 8-11, 11-4 in 51 minutes. The remainder of the round two matches will take place this evening when number two seed and defending champion Amanda Sobhy is in action against Czech Republic’s Anna Serme. Wales’ World No.10 Tesni Evans will take on USA’s Olivia Fiechter, Canada’s Hollie Naughton will face Egypt’s Nada Abbas and Egypt’s Nadine Shahin comes up against home hope Haley Mendez. United States home hopes Haley Mendez (right) and Olivia Fiechter both secured their places in round two of the J Warren Young Memorial Texas Open after 3-0 wins over Netherlands’ Tessa ter Sluis and Malaysia’s Weenee Low, respectively. The PSA Bronze tournament is hosted alternatively in Dallas and Houston every year, with this year’s instalment held in Dallas, and is the second oldest women’s professional squash tournament to be held in the United States. Action on day one saw home hopes Mendez and Fiechter both complete comfortable victories to move into the second round. World No.45 Mendez defeated Ter Sluis by an 11-2, 11-8, 11-3 scoreline, while World No.52 Fiechter took 17 minutes to defeat Low 11-6, 11-3, 11-1. Mendez and Fiechter will now face Egypt’s World No.33 Nadine Shahin and Wales’ World No.10 Tesni Evans, respectively in round two. Meanwhile, Welshwoman Ali Loke will face top seed England’s Sarah-Jane Perry for a place in the quarter-finals after she defeated Colombia’s World No.74 Catalina Pelaez in a tight five-game encounter. Loke was forced to come from behind twice as she eventually closed out a 5-11, 12-10, 9-11, 11-8, 11-2 win. Czech Republic’s Anna Serme will take on defending champion and USA No.1 Amanda Sobhy in the second round after she conquered Canada’s Nicole Bunyan in five-games. Serme was forced to hold off a comeback from the Canadian to secure an 11-5, 11-13, 11-7, 11-13, 11-6 in a tough 52-minute battle. Elsewhere, England’s former World No.2 Jenny Duncalf went down in straight-games to Egypt’s World No.68 Menna Nasser who will now face former World No.1 Rachael Grinham for a place in the last eight. There was also joy for Belgium’s World No.43 Tinne Gilis and Finland’s World No.66 Emilia Soini, who defeated Egypt’s Salma Youssef and Switzerland’s Nadia Pfister on the opening day of action. Ties against Netherlands’ Milou van der Heijden and England’s Victoria Lust await Gilis and Soini, respectively.